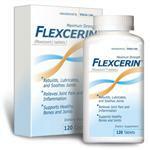 Flexcerin/Flexoplex is a joint supplement manufactured by the same company under two different names. Henceforth we will just refer to it as Flexcerin. Flexcerin is a is a well-rounded supplement. It has 6/9 of the ingredients we are looking for in a joint supplement. It was one of the several supplements that has boron. Their formula also includes Boswellic acid, a standard dose of glucosamine sulfate, chondroitin sulfate, MSM, and hyaluronic acid. Flecxerin has no dyes, arificial ingredients, or dangerous ingredients we are aware of. Glucosamine Uses 1500mg of low quality glucosamine sulfate. As stated before, glucosamine HCl is better. Glucosamine is a precursor to glycosaminoglycans which are a major component of joint cartilage. Chondroitin Sulfate Has 1200mg of chondroitin sulfate, the average amount in the industry. Chondroitin makes up glycosaminoglycans which are a component of cartilage. Boron Has 6 mg of Boron, one of the most important ingredients for joint health. People that have boron as a part of their diet have a lower chance of developing osteoarthritis. Avocado Soy Unsaponfiables (ASU) Does not have ASU, one of the proven treatments for arthritis. ASUs are commonly prescribed in France for the treatment of arthritis. Methylsulfonylmethane (MSM) Has 700mg MSM, moderately more than other supplements. MSM is a vital source of sulfur for protein and connective tissue synthesis. Boswellia serrata Has 100mg of 20-30% boswellic acid extract. That’s 20-30mg of boswellic acids. Boswellic acids are anti-inflammatory compounds. Cetyl Myristoleate (CMO) Does not have CMO. Cetyl myristoleate is a compound found in the joints of arthritis-resistant mice. Hyaluronic Acid Has 100mg of hyaluronic acid, a good amount. Hyaluronic acid is a vital fluid found in the synovial (joint-lubricating) fluid. do you take all 4 caps at once or each daY? I purchased Flexoplex for $199.95 it was one of the worst mistakes that I made in my lifetime. After taking for about 3 weeks my neck got so stiff that I couldn’t move my head, and the pain was excruciating to a point of thinking of ending it all. I had to be taken to an emergency room and given morphine for the pain. Also my legs swelled up and developed blisters that have now stopped running and the swelling is going down. My neck is now coming around after three weeks of therapy, I’ve learned my lesson, don’t believe all of the testimonies. the reply people informed are very dangerous so i did this mistake too and have already ordered,please elaborate on this product. Hi, I’ve been taking this supplement for almost 10 years. I have severe scoliosis and the pain was sometimes unbearable. I had tried ostio bi-flex without success. I couldn’t live (comfortably) without this product. That said, I have had severe hair thinning over the last decade and my once overly thick hair is now shear. It is not hereditary and I have no thyroid or hormone issues, doctors are stumped. Do you have any knowledge of potential hair loss associated with this product or any included ingredient? I’m sorry but this product is basically useless and just plain doesn’t work. To rate this as the best is misleading. I was much more satisfied with beneflex as effective=completely. Just didn’t care for their automatic tagging and billing with shipments monthly to my credit card. My mistake as that product was effective where yours is totally useless and I’m stuck with 3 more month supply. Lesson learned…don’t beleive so called experts on the internet. Flexoplex didn’t help me any more that the regular glucosomine I bought at Costco, AND you had to take TWICE THE AMOUNT (4 pills a day). What a rip-off. In fact I think it didn’t help me at all and it’s probably made out of crushed asprin. DO…NOT…WASTE… YOUR MONEY ON THIS RIP-OFF item. I m shocked by the comments submitted by Melfoed Osche. It is request to please let us know that what reasons doctors assessed that it was acually due to fexoplex or soem other reason. This product DOES NOT WORK! Moreover, the company, Ihealth, will not stand behind their product!! They say they give you a 60 day money back guarantee, but if you call them they inform you that you need to return the remaining pills in the original container, in order to qualify for the money back policy, even if you took ALL the pills and tossed the container!?!? DONT WASTE YOUR MONEY, this is a SCAM!! !